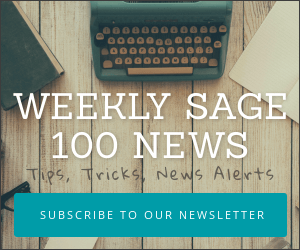 Last week Sage sent around a pre-release guide to their upcoming MAS90 Online offering. Expect this to become available in October 2011 and MAS90 Online to be a competitively hosted version of MAS 90 aimed at companies in the 1 to 5 user range. 1. Upgrades have to be done by the partner and by downloading the data and then uploading the newly updated/converted data. This means Sage doesn’t upgrade the customer automatically — and the customer still had the expense of having a partner (or themselves) doing the upgrade. This sort of baffles me but I guess at least the hosting saves some complexity. 5. Phone support is additional/optional (maintenance is mandatory ). 6. Business Insights Dashboard and Business Insights Explorer will be available within the Sage ERP MAS 90 Online service. Sage ERP MAS Intelligence (SMI) is under evaluation for compatibility at this time. Online user license for one year is required to access the software, with optional add-on user licenses and services available for additional fees. Included in the monthly subscription fees are: the secure backup service, up to five Sage ERP MAS 90 Online companies, one gigabyte of personal storage, and one free named user license of both Microsoft Word and Microsoft Excel. Discounts will be offered for multi-year contracts and pre-payments. Sage ERP MAS 90 Online user licenses ($169*) are concurrent licenses and can be used by a pool of users. In addition to Sage ERP MAS 90 Online user licenses, Sage also offers optional Remote Concurrent Access License (RCAL) for an additional monthly fee ($75*). RCAL licenses allow user access to Sage ERP MAS 90 Online system ─ but differ from Sage ERP MAS 90 user licenses, because they are named Citrix users. 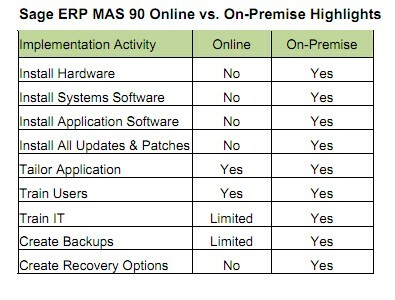 Sage ERP MAS 90 Online is scheduled to launch in October 2011. Sage is currently looking for clients and partners to participate in an Early Adopter program. We are specifically looking for clients to go “live” in September to help Sage ensure the system is ready to go. Sage will cover the first two months of the Sage ERP MAS Online subscription fees for clients participating in the Early Adopter Program. If you have a (prospective) client who would be interested in the Early Adopter program for Sage ERP MAS 90 Online please contact me at jamie.kandola@sage.com. Note: As of now only new users are being accepted. In the future this program may open up to existing users of Sage ERP MAS90 or 200.